I had one of those kind of days last week that I just needed a piece of dough covered with cheese. 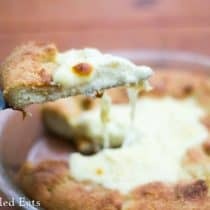 I’ve been wanting to make a low carb calzone for a long time but I was afraid of all the cheese oozing out since low carb mozzarella dough needs to cook longer than traditional wheat pizza dough. My solution was to add an egg to the ricotta and to bake the calzone in a pie plate. 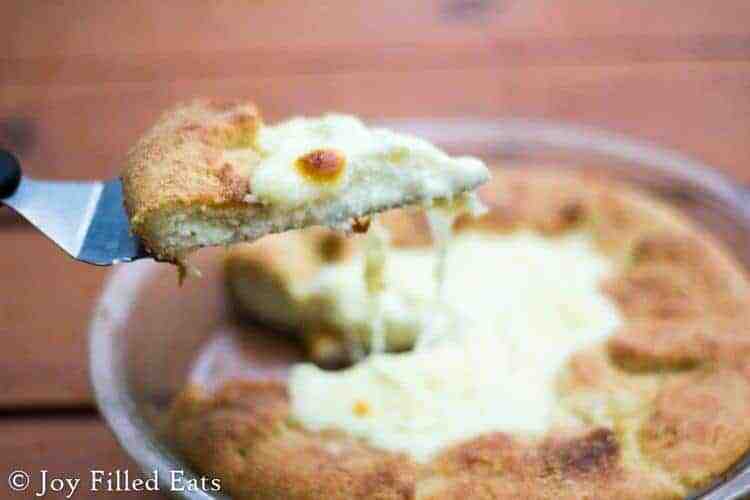 There was minimal oozing and the few holes around the edge of the crust were sealed as the cheese melted. My Cheese Calzone Pie was the perfect end to a long day. I was working on a recipe about 4 pm so I wasn’t hungry when I fed the kids at 6 but at 8 I was ready for dinner. My husband was at a work thing so I was flying solo and I wanted comfort food. I’ve made my mozzarella dough so many times over the last few months I could probably do it in my sleep. It only takes me about 5 minutes to whip up a batch. I prefer cheese calzones with just cheese. Maybe a bit of ham on occasion but normally just cheese. I like pizza with tons of crazy toppings but ricotta plus mozzarella is normally enough for me. If you want to add some other toppings into this go for it! 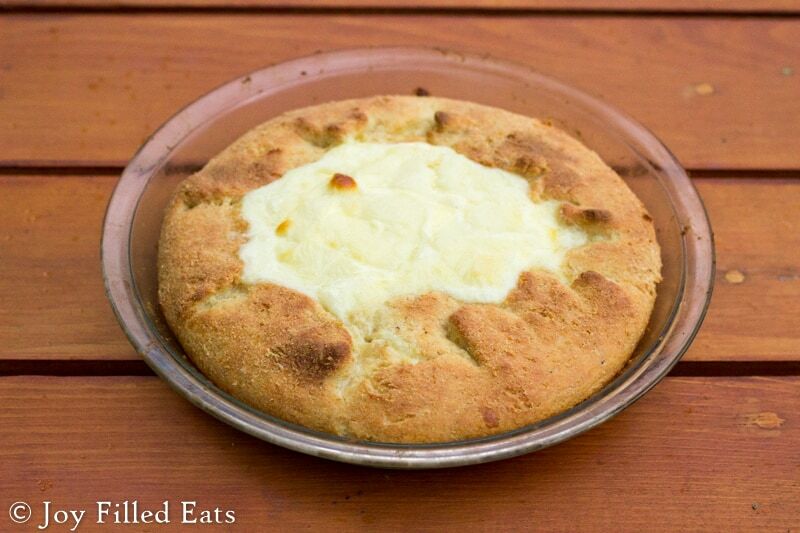 My friend Sarah from My Montana Kitchen has a great Stromboli recipe you should go check out too. 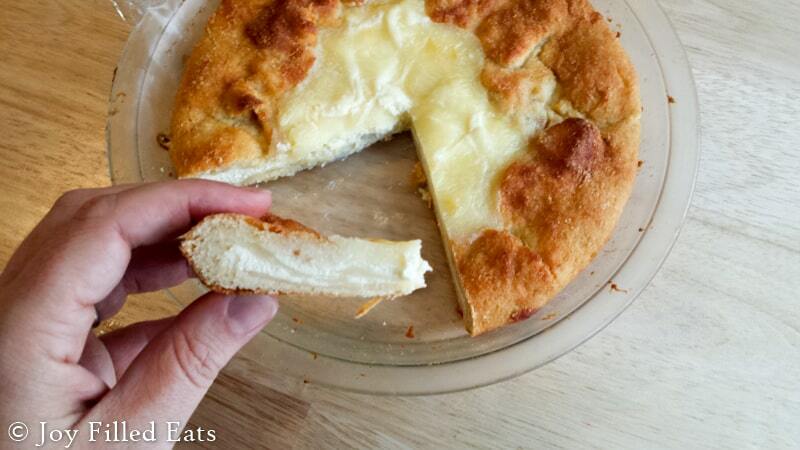 Put the shredded mozzarella cheese and cream cheese in a microwave safe bowl. Microwave one minute. Stir. Microwave 30 seconds. Stir. At this point all the cheese should be melted. Microwave 3o more seconds until uniform and gloopy (it should look like cheese fondue at this point, if it doesn’t keep microwaving in 30 second increments). Mix in the egg and baking mix. You will need to dump it onto wax paper and knead it by hand to thoroughly incorporate the ingredients or you can do this in a food processor with the dough blade. 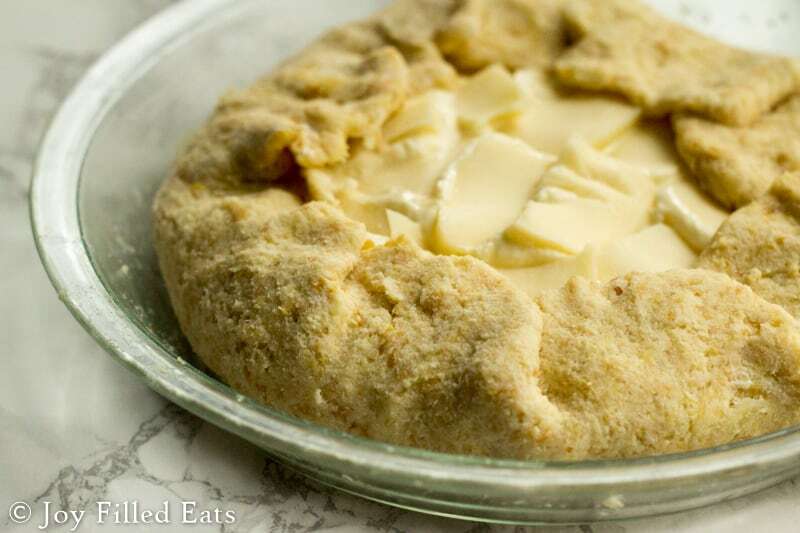 Put the dough in a pie plate and spread it thin across the bottom and thick up the sides. 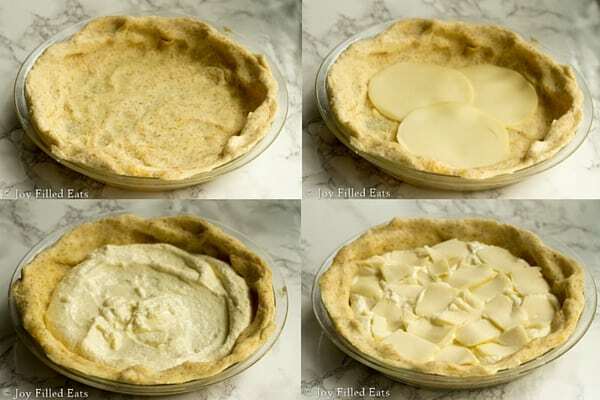 You will spread out the sides later. Put three pieces of provlone in the bottom. Mix the ricotta, salt, and egg. Put that in next. Top with the sliced mozzarella. Now, gently pull and smush the dough on the sides so you can pull it over the top a little (like in my photos). Bake for 20-30 minutes until golden brown. Cool for 5 minutes and then slice and serve. This is also excellent cold. I ate leftovers for breakfast the next two mornings and brought the last two pieces on a road trip for lunch in the car. Can something else be substituted for the golden flax? You can use additional almond flour. This is really good! I added sliced pepperoni on top of the ricotta mixture, otherwise I made the recipe as written. And you're right, it is good cold too! Thanks for a great recipe, I'm sure I'll be making it often. 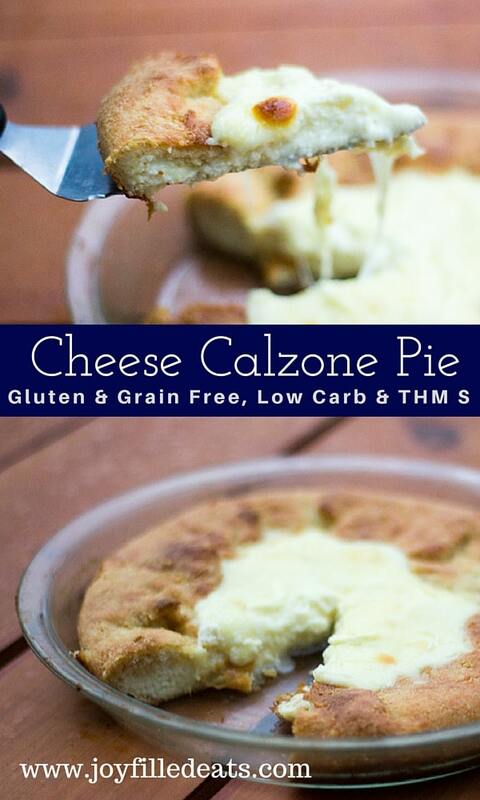 I made your Cheese Calzone Pie today and it was ridiculously awesome!! I was slightly intimidated by the recipe; however, it came together much easier than I had it built up in my head. I also tweaked it slightly (and I'm sure altering the nutritional values slightly) by adding to the Ricotta Cheese mixture some diced deli ham and 2 slices of diced pineapple that I needed to use up. Whoa. It was Pizza Parlor quality for sure. This is going into my rotation. Thanks for such a great recipe (as well as your Lazy White Lasagna -- love, love, love!). This looks amazing! Anything with gooey cheese is a must-try if you ask me.